Jennie and Bob both have ongoing health issues which makes it difficult to care for their trusted companion ‘Rockytoo’, an excitable two-year-old border collie. They joined the LinkPETS program so that Rockytoo can still get his weekly walks, but they’ve also met some wonderful people too! We caught up with Jennie to talk about the LinkPETS program and got to meet the wonderful and lively Rockytoo. How did Rockytoo get his name? We had Rocky our first dog and he got cancer when he was 12 years old. It wasn’t long before we knew we had to get another one….and we were just so in love with our Rocky. Why did you join LinkPETS? Having Rockytoo and knowing that he needed to be walked, that was the big thing that hit us. We got him at 8 weeks and he has became more and more part of our lives – he really is our son. Unfortunately, we aren’t able to walk him with our ongoing health issues, so having the support of the volunteers has been wonderful. How long have you been part of the program? We joined the program in 2015, when Rockytoo was quite young. It came about when I was caring for Bob and then I ended up in hospital and it all got a bit too much. I knew then that I needed extra help caring for Rockytoo. What support has Hazel your LinkPETs volunteer provided to you? She has been amazing, she checks to make sure we are alright. She has been concerned about me ever since I injured my leg. I couldn’t leave the chair for a few weeks and she would come around and give me a big cuddle and took an interest in what’s going on. That’s the sort of people that are involved in this program. How has the LinkPets program helped you and Rockytoo? Well I’ll be very honest and say seeing Rockytoo so happy and to love these people so quickly – and for them to love him back, that’s what special. And then for us to get to know them too – we have made so many new friends. Oh gosh, I think the program has saved our lives! You can see how much Rockytoo means to us and knowing that he is still getting his weekly walks means everything to me. It’s filled our lives, beautifully. Through the love of their dog and LinkPETS, Jennie and Bob have met some wonderful people and still feel part of their community. 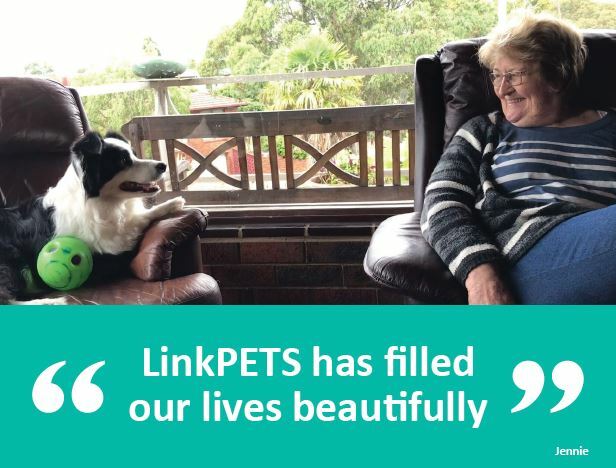 If you know someone who is over 65 and needs help caring for their pet, then LinkPETS can help! Contact Sarah Burton, Volunteer Support Officer on 8822 8309 for more information.